Pakistan Super League third edition is being played in Dubai and Sharjah cricket stadiums and various international players are part of the different franchises, who play the matches during PSL 3. It was decided that the playoffs and the final match of the third edition of Pakistan Super League will be played in Lahore and Karachi respectively. The first stage matches have been played and now PSL is entered in the final stage and playoffs and final of the PSL3 will be played in Pakistan and all of the security arrangements have been made. It is reported that Alex Hales of England will not come to Pakistan to play the matches from his franchise, Islamabad United. The English Cricket Board has adopted the strict policy to travel to Pakistan. Other English players like Jason Roy, Eoin Morgan and Sam Billings will not come to Pakistan to play the playoffs and final of the PSL, which will be conducted in Lahore and Karachi respectively. 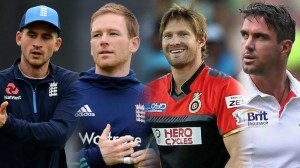 The English cricketers like Kevin Pietersen and Shane Watson showed their desire to come to Pakistan to play the playoffs and final of the mega event but they did not make the final decision to come to Pakistan. The teammate of Kevin Pietersen, Sarfaraz Ahmed said the KP will make good decision. He said that they suffered the loss last year and now he will realize the situation as the absence of the international players will result into loss of the match. The list of the players is shared, who refused or remain doubtful for the mega event of PSL 3 eliminator matches. Some sources said that the administration of PSL cannot take the risk to conduct the final of the mega event without the international players and it is hoped that the final of the mega event will be shifted to Dubai or the overseas players will be offered additional bonuses.